To create a beautiful cluster of stem plants, it is necessary to think of planting patterns and to plant them densely and carefully. 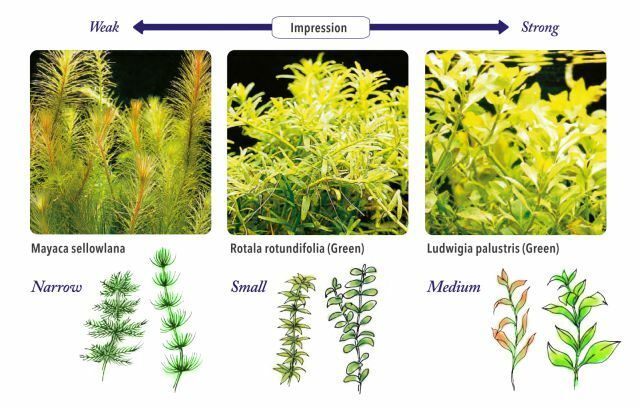 This section introduces the visual impact and the planting methods of stem plants based on their leaves and their colors. Stem plants come in various leaf colors, shapes and sizes. If you select only a similar type of leaves, the cluster may look organized but it often becomes monotonous. Avoid excessive use of large leaves or the cluster might look flat. 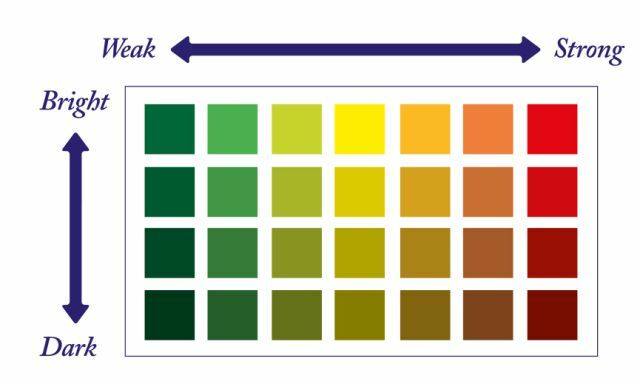 Color impact varies depending on the leaf color. Red plants have a stronger impression than green plants. Taking that into consideration, let’s work on the plant arrangement suited for the center set on the layout composition (refer to C on the next page). The position of the focal point in the layout composition is very important. The balance of approximately 3:2 should basically be achieved in the layout as per the golden ratio of 1.618:1. In line with this thinking, the plants having larger leaves or stronger color should be planted on the focal point side. The basic plant arrangement is to locate high-impact plants, such as stem plants with large leaves or red plants, on the range of focal point in the layout (i.e., red shaded zone in the above illustration). When arranging red plants in one location, it is a cardinal rule to lap over the range of focal point. For stem plants which will develop large leaves, it is easier to achieve dense planting by removing their lower leaves in advance. It is also important to use specialized Pinsettes for aquatic plants and to work on planting as checking the planting space left. 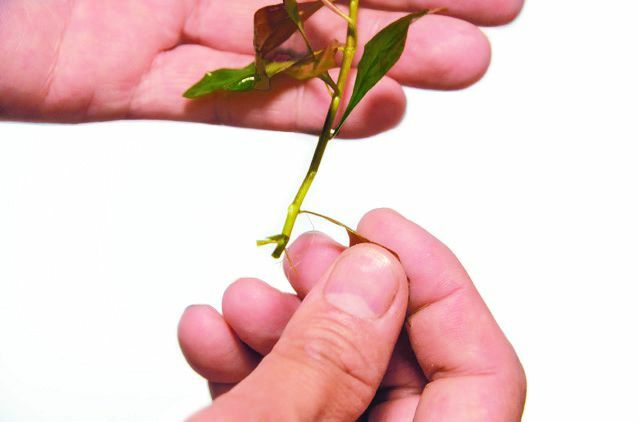 For stem plants with broad leaves such as Ludwigia, remove the leaves on two lower nodes. 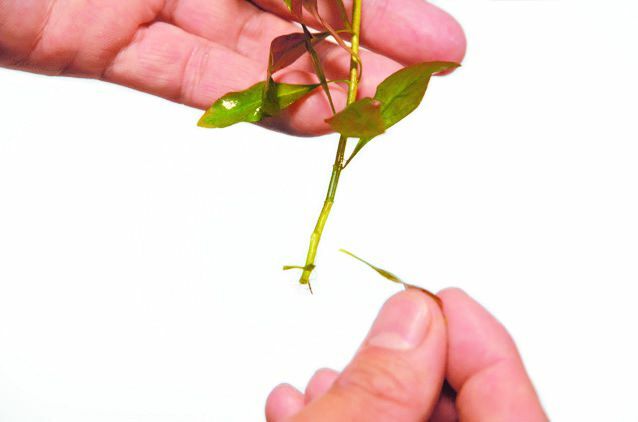 Since those lower leaves easily fall off and can cause rotten stem if left untreated, it is advisable to remove them before planting in order to make dense planting easier. 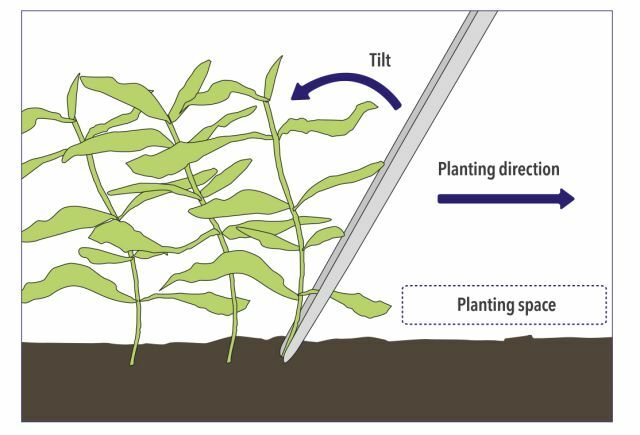 For neat and dense planting of stem plants, it is important to tilt the plants against the planting direction to secure planting space. Make sure of planting direction before starting the job. 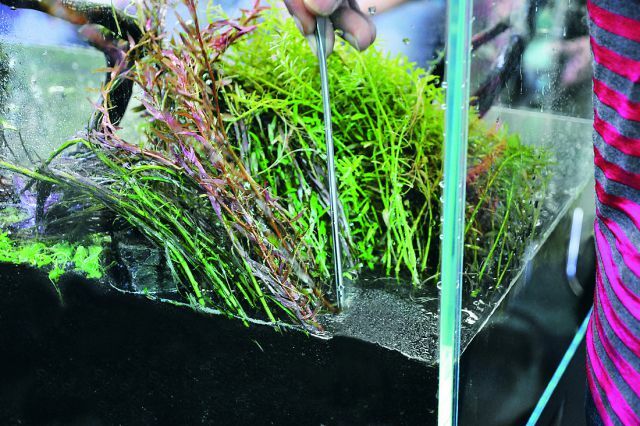 Another tip for dense planting is to pour water just up to the substrate level.